← Tartiflette – And Can’t We Give Our Kids More Credit? Another week down and another weekend coming to a close in a blink of an eye. I remember when time used to drag unbearably when I was a child. I wish we could make time do the same in adulthood. Or at least have more control over it. Some things I am ok with rushing through. I was lucky growing up, no matter how busy my mum got with work and overtime, we would have fresh baked goods. Cookies were the main thing along with fresh bread but we got to enjoy cakes, bars, and pies as well depending on the holiday. She would sometimes feel bad that she worked so much but I always said the time she spent with us was quality. And we knew we were loved by the effort put into our meals made from scratch. I equate that type of effort for your family with love. It gives me no end of joy to see our kids grasping that and wanting to learn themselves. I know they’ll be fine when they are out in the world and they’ll pass it on to their kids. I had some fresh cherries left over after doing the cherry sauce for the pork and we needed to use them before they went off. So I flipped through my baking books for inspiration and something the kids would enjoy. 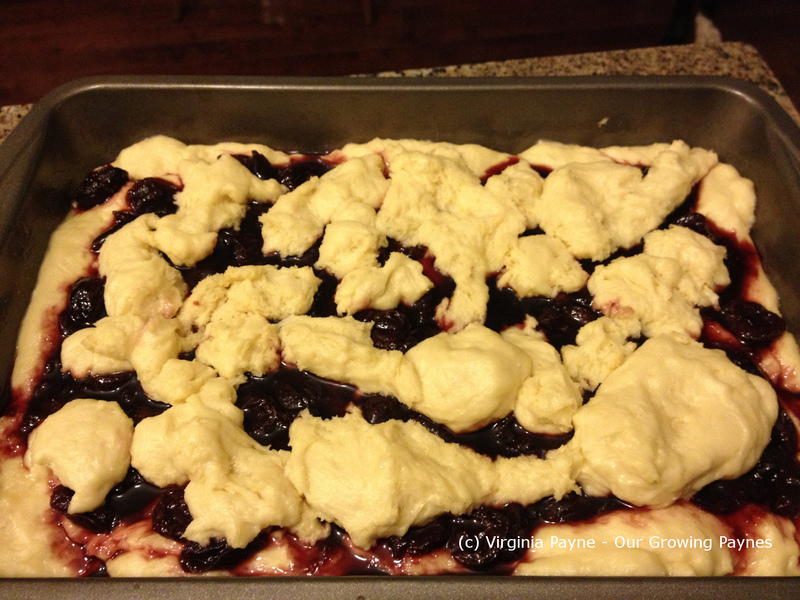 I came across cherry squares in the Pillsbury The Complete Book of Baking. It does call for the canned cherry pie filling. No thank you! The only pie filling I buy is for the pumpkin pie and I have to add stuff to that. The cherry pie fillings are just sicky sweet and full of junk. So I decided to make my own filling. Super easy and not overly sweet. I should say the sauce bit is easy. If you don’t have a cherry pitter, as we don’t, it takes awhile to get all the pits out. I may need a new gadget! 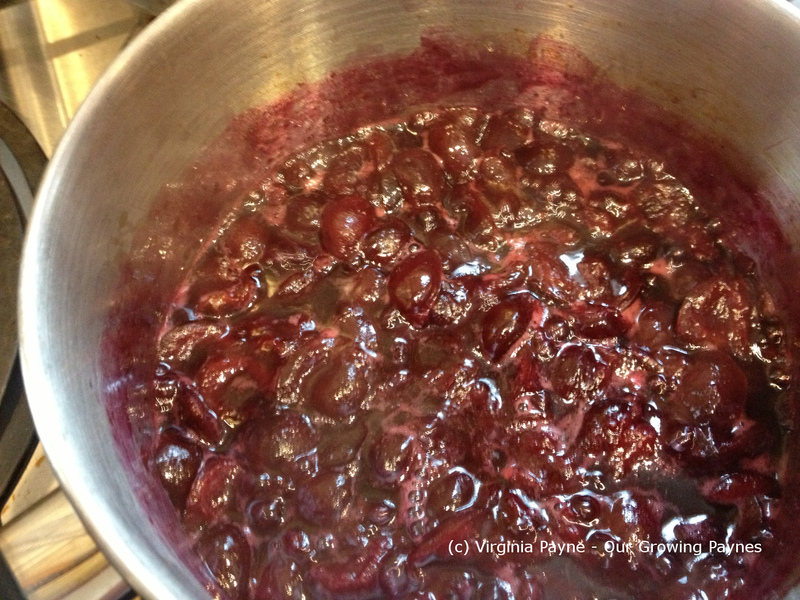 In a sauce pan add the cherries and about a 1/4 cup of water and bring to a boil. As the cherries start to break down add about a 1/4 cup of brown sugar. 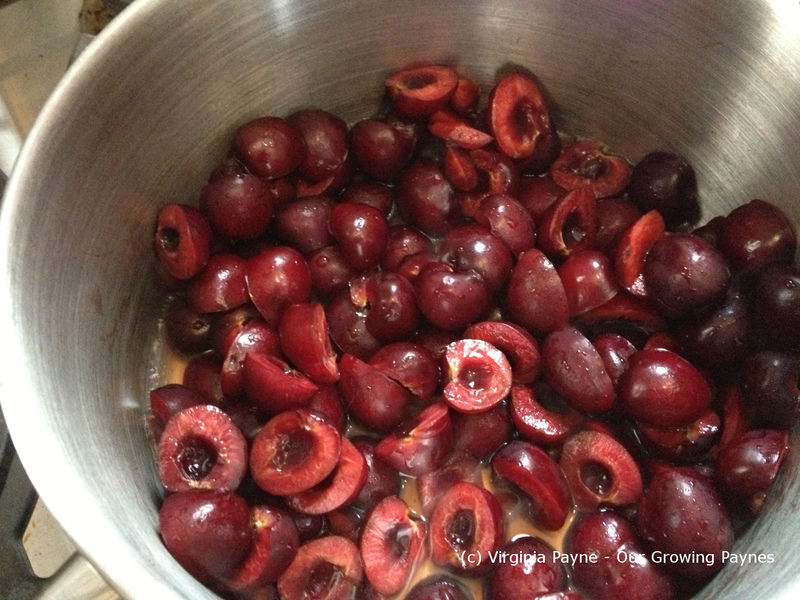 The ratio was about a cup and a half of cherries to 1/4 cup brown sugar. Continue to simmer until it thickens into a jammy sauce. Set this aside to cool. 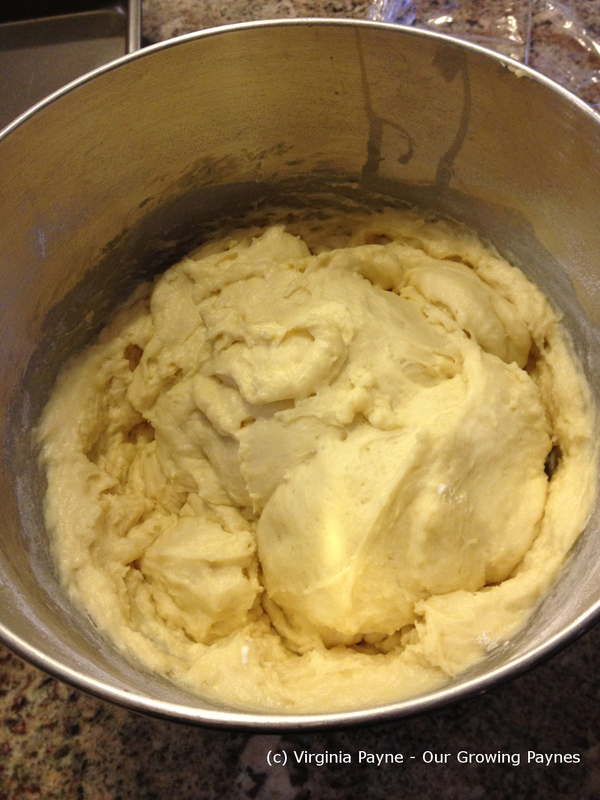 For the cake dough add to a mixing bowl 1 1/2 cups of flour, 1/4 cup sugar, 1tsp salt, and a tsp of yeast. Mix this well. 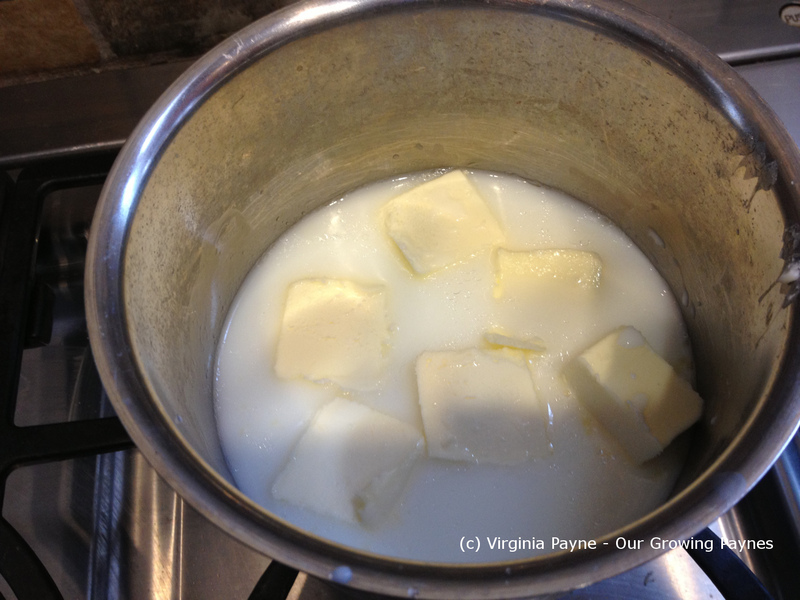 In a small saucepan warm up 1/2 cup water, 1/2 cup milk, and 1/2 cup of butter. Don’t boil but you want it very warm, warm to the touch. So not scalding. 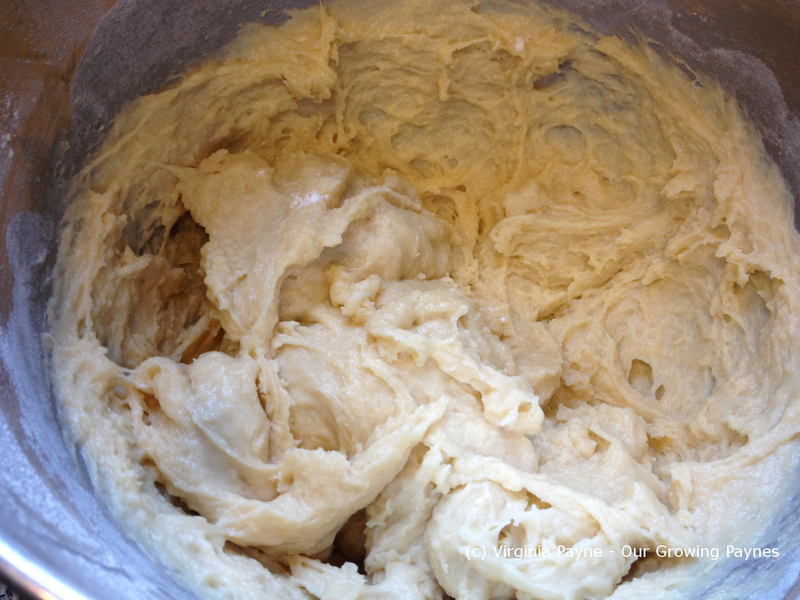 Add the warm liquid to the flour mixture then add 2 eggs and mix well. 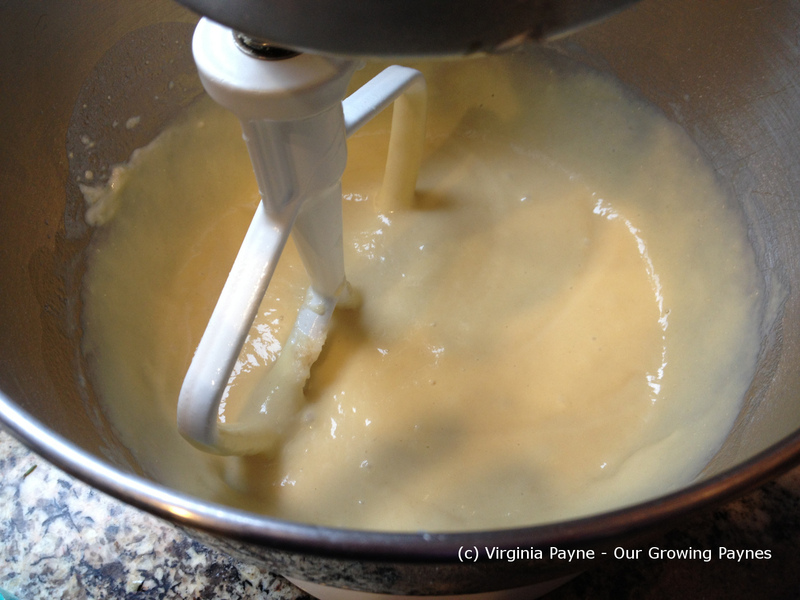 Once it is mixed well turn the mixer to medium speed and mix for about 3 minutes. Next add a bit of flour at a time until the batter becomes stiff. This will range from 1 to 1 1/2 cups of flour. Cover and to rest and rise until double in a warm place. This will take 45-60 minutes to complete. 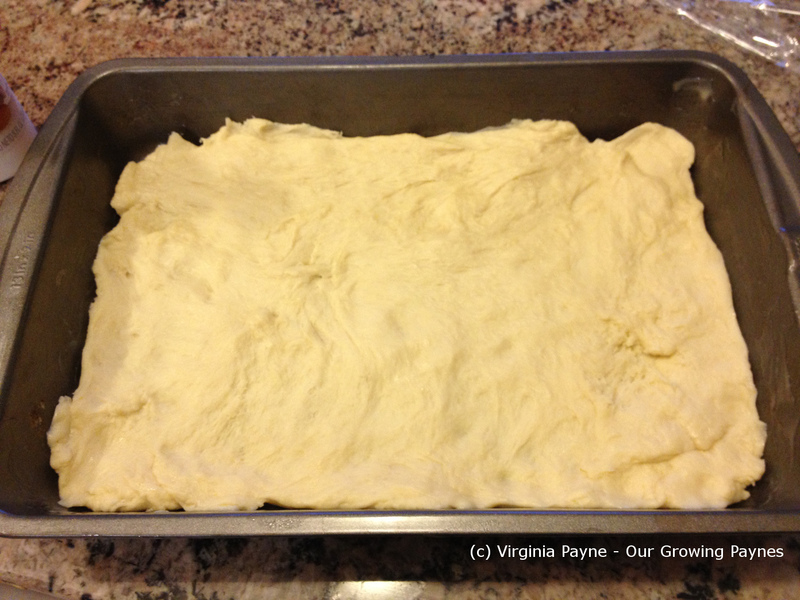 In a greased 13 x 9 inch pan spread 2/3 of the dough out. This is a bit tricky as it will slide about in the pan and as it is elastic it takes a bit of doing. Spread the cherry sauce over the top. 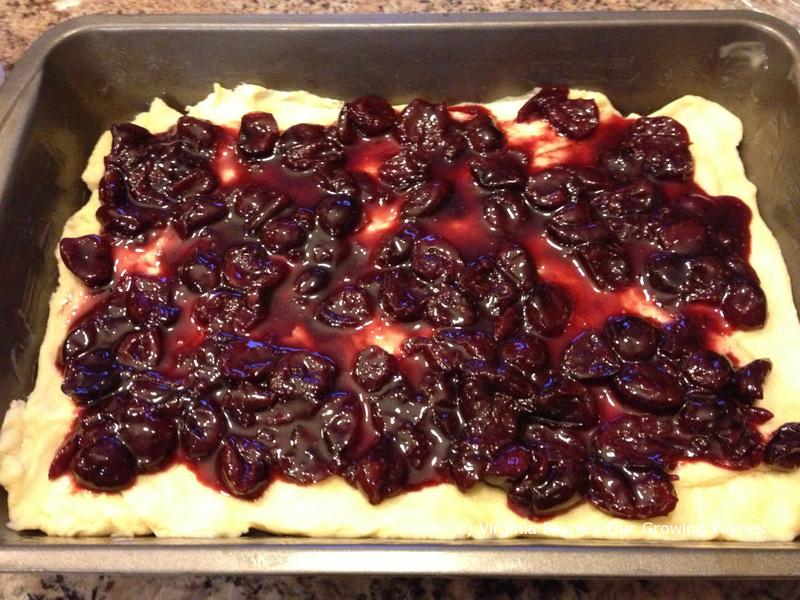 Take the remaining dough and dollop it over the cherries in small clumps. This leaves about half the cherries exposed. Let it rise again for 20-30 minutes. While this is rising preheat the oven to 350F/180c. Bake for 35-40 minutes until it is nice and golden. While it is baking make the glaze to drizzle on top. Whisk 1/2 cup powdered sugar, 1/4 tsp almond extract, and about 4 tsp of milk. 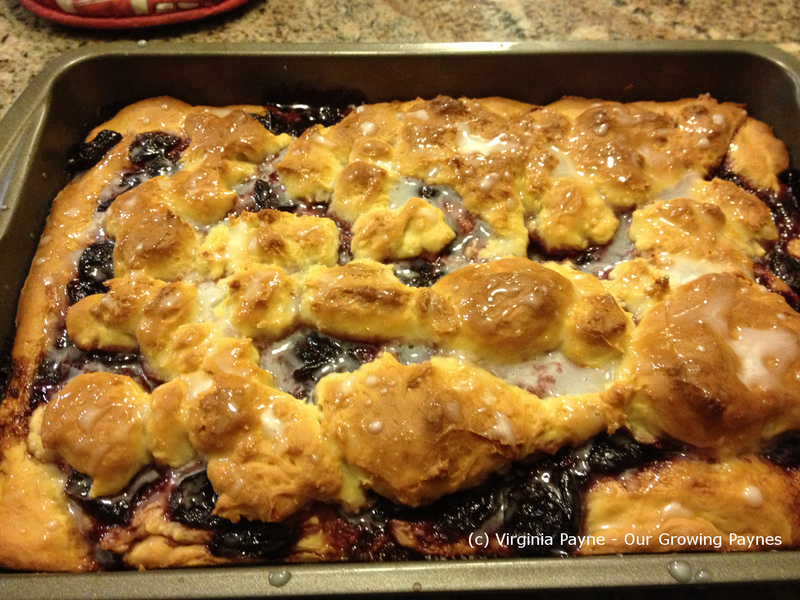 This entry was posted in Baking and tagged baking, butter, cherries, cherry squares, dessert, food, yeast dough. Bookmark the permalink. YUM, Your photos make this look so tasty! I will try it! Hah! I bet that didn’t last long. Yes, it takes a while to pit those cherries without the, hmm, pit thing. I still haven’t bought one. And the fingers get stained red to boot. It’s cake like with a cross of sweet bread. Along the lines of coffee cake. Very appealing dessert. 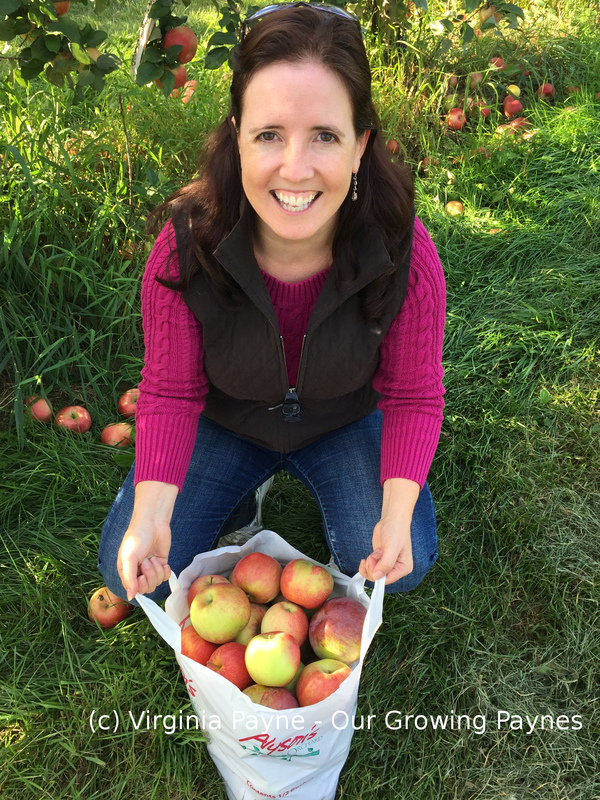 Where did you find fresh cherries in the middle of winter. I don’t like canned cherries but frozen are quite good and I could use them in this recipe until the summer. Gosh, that looks lovely. 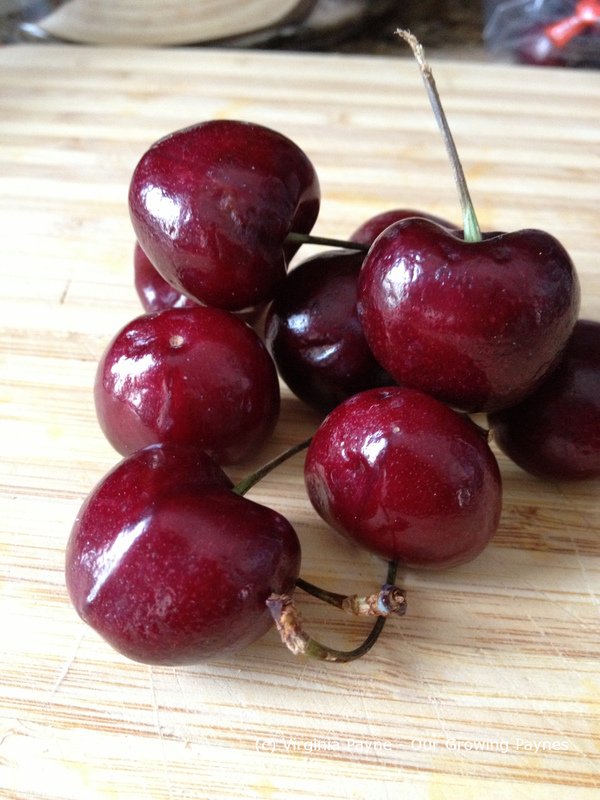 But seeing the cherries brought me back to this summer, sitting on the dock at a friend’s cottage and eating fresh, sweet cherries and spitting the pits into the lake. Sounds much better than what we are facing right now with 8-14″ of snow forecast.